Fifty-five middle school students from 12 Central New York school districts joined Congressman Dan Maffei and representatives from Honeywell and the Milton J. Rubenstein Museum of Science & Technology (MOST) to kick off the 2010 Honeywell Summer Science Week at the MOST on Monday, July 12. The students are studying and exploring the Onondaga Lake watershed and engaging in unique hands-on learning, including studying local birds in their habitats, bug collecting, water testing, geology and environmental sampling procedures. Congressman Maffei explained to students participating in the week-long Honeywell Summer Science Week at the MOST why becoming a scientist, engineer or mathematician is so important for Onondaga County. 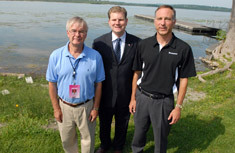 Congressman Maffei (middle), Honeywell Syracuse Program Director John McAuliffe (right), and MOST President Larry Leatherman (left) in front of Onondaga Lake. Created by the MOST, Honeywell Summer Science Week is made possible by a generous grant from Honeywell Hometown Solutions. The program is taking place from July 12 through July 16. 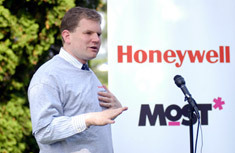 Congressman Maffei proclaimed July 12 – July 16 Honeywell Summer Science Week at the MOST. Students from the Syracuse City School District stand with Congressman Maffei in front of Onondaga Lake. John McAuliffe spoke with students about what they are looking forward to most about Honeywell Summer Science Week at the MOST. MOST Exhibits Project Manager Peter Plumley talked to students about the exciting science experiments they will experience. 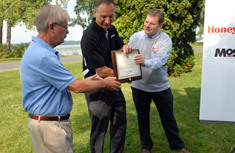 Congressman Maffei presented the proclamation for 2010 Honeywell Summer Science Week at the Most to John McAuliffe and Larry Leatherman. Students are participating in a combination of activities at the MOST and various field locations, while applying an interdisciplinary approach for investigation, discovery and resolution of environmental issues facing Onondaga County. Field activities include collecting water samples throughout the Tully Valley and the Onondaga Lake watershed, touring Onondaga Lake and conducting experiments at the Shrub Willow Farm in Camillus. Local organizations participating as workshop presenters include the Montezuma Audubon Center, the U.S. Geological Survey, the State University of New York School of Environmental Science and Forestry (SUNY-ESF), and Onondaga County Department of Water Environment Protection. John McAuliffe asked students to raise their hands if they like science. Graduate students from SUNY-ESF are leading the students on their explorations around the Onondaga Lake watershed. The MOST will host Honeywell Discovery Day on Wednesday, July 21, 2010. Students will begin the day with a boat cruise on Onondaga Lake. During the afternoon, students will make presentations to parents and teachers about their findings from their week of exploration. The students will also be given certificates of participation and awards for notable accomplishments. Academic partners include middle school teachers from the participating school districts, Montezuma Audubon Center, as well as faculty and graduate students from Syracuse University and SUNY-ESF.